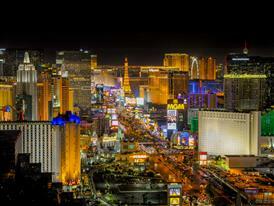 For the third consecutive year, Las Vegas continued historic visitation growth, setting a new all-time record. Las Vegas welcomed 42.9 million visitors in 2016, surpassing 2015’s record-setting 42.3 million. In addition to hosting millions of leisure travelers, the destination celebrated record-breaking convention visitation in 2016, welcoming more than 6.3 million business travelers during the year. For more information, contact Amanda Arentsen, LVCVA, aarentsen@lvcva.com. The LVCVA continues its longstanding position as a leader in the travel industry by earning the prestigious Gold Travvy Award for Best Tourism Board U.S./Canada. Known as the Academy Awards of the travel industry, the Travvy Awards recognize the world’s best of the best in travel. The annual Travvy Awards, presented by travAlliancemedia, recognize the highest standards of excellence in the travel industry and honor travel companies, travel products, travel agencies and destinations for their outstanding achievement. Winners were selected based on more than 100,000 votes—the largest voting block in history—submitted by the travel agents who sell the vast majority of these trips to tens of millions of consumers every year. For more information, contact Amanda Arentsen, LVCVA, aarentsen@lvcva.com. On Jan. 28, a new culinary energy emerged as Zuma opened its doors for the first time on the West Coast at The Cosmopolitan of Las Vegas. This marks the iconic brand’s eleventh location in its international collection. Created and co-founded by acclaimed Chef Rainer Becker, Zuma takes its inspiration from the popular Japanese izakaya, where guests enjoy a dining and drinking style that uniquely embraces every element of Japanese cooking under one roof. The foundation of Zuma’s philosophy offers an authentic and complete dining experience, where all elements are of equal importance and each complements the taste and flavor of the cuisine. The extraordinary 9,000-square-foot restaurant features beautiful views of the Las Vegas Strip and offers two glass-enclosed private dining rooms, both of which seat 14 guests. For more information, contact Jennifer Cornet, Bread and Butter PR, jennifer@breadandbutterpr.com. Maintaining an ongoing commitment to the men and women of the armed forces and in honor of USO Day on Feb. 4, Harrah’s Las Vegas will offer military discounts year-round. Located at the center of the Las Vegas Strip and touting a newly-renovated hotel tower, Harrah’s Las Vegas offers active duty military and veterans a number of discounts and special deals on everything from rooms to restaurants to shows. For more information, contact Kristin Soo Hoo, Caesars Entertainment, ksoohoo@caesars.com. Chef Charlie Palmer’s reimagined Aureole at the Mandalay Bay reopened in January. The renowned restaurant now offers a tasting table experience designed for the way people eat and drink today. Chef Palmer renewed his commitment to preparing quality, local ingredients in a bold, American style, and upholds Aureole’s longstanding position as one of the greatest wine restaurants in the world. The transformed space offers three distinct dining experiences: an intimate bar and lounge area; an approachable main dining room; and the fine dining Fountain Terrace, all highlighted with warm hues and wine-inspired design elements. For more information, contact Christa Weaving, Charlie Palmer Group, cweaving@charliepalmer.com. On Jan. 2, The Venetian, The Palazzo and Sands Expo, in partnership with Zappos, began offering guests access to a first-of-its-kind co-working space in the heart of The Venetian/The Palazzo Congress Center. The 1,170-square-foot pop-up lounge will offer space to recharge, huddle areas for collaboration and a conference room for small meetings. The space is enclosed for noise management but is also transparent to invite guests to come inside and take advantage of the amenities, which include Wi-Fi, charging stations, four private phone rooms and the private conference room that seats six. For more information, contact Keith Salwoski, The Venetian/The Palazzo, keith.salwoski@sands.com. Caesars Entertainment has partnered with Three Square to donate surplus food items from conferences and events through Three Square’s Food Rescue program. As a contributor to Three Square’s Food Rescue program, Caesars Entertainment is able to take further action towards their Code of Commitment with the ability to simultaneously help fight hunger and reduce waste in the community through their donations. The Food Rescue program is a safe and reliable donation outlet that sources edible food to feed hungry people in Southern Nevada. The Rio is the first Caesars Entertainment property to begin donating to Three Square with other Las Vegas properties to follow throughout 2017. For more information, contact Caitlin Batoon, Caesars Entertainment, cbatoon@caesars.com. On Jan. 6, Wynn Nightlife introduced their exclusive three-year residency with three-time Grammy-nominated and multi-platinum pop duo, The Chainsmokers, at XS Nightclub and Encore Beach Club. The venues will be the only nightclub and dayclub in the U.S the hit makers, comprised of Andrew Taggart and Alex Pall, will perform at through 2019. For more information, contact Deanna Pettit-Irestone, Wynn Las Vegas, deanna.pettit-irestone@wynnlasvegas.com. Lip Smacking Foodie Tours and Maverick Helicopters have partnered to zoom guests from first-class to head of the class during the extravagant “Savory Bites & Neon Lights” tour. Guests will be whisked inside five of Las Vegas’ most exclusive restaurants for tantalizing treats before boarding a helicopter to take in a breathtaking bird’s eye view of the city’s unparalleled glittery glamour. The extraordinary evening begins with guests escorted past lines directly to a VIP table at the renowned restaurants to enjoy three to four signature dishes as an expert guide provides insider stories and invaluable tips about the entertainment capital of the world. Following, guests will be driven via a limo coach to Maverick Helicopters, where they’ll indulge in a champagne toast before boarding an ECO-Star helicopter. The 12- to 15-minute flight will soar above both east and west ends of the Strip, providing a heart-stopping view of iconic landmarks. For more information, contact Brigitte Ruiz, Kirvin Doak Communications, bruiz@kirvindoak.com. The Plaza Hotel & Casino in conjunction with Life is Beautiful Festival and global art curator Justkids has partnered with contemporary street artist Shepard Fairey and English multimedia artist D*Face to unveil new murals in Downtown Las Vegas on Feb. 11. Located on the exterior of the property, the works are the latest additions to Downtown’s ever-growing outdoor art gallery curated by Life is Beautiful. Fairey, best known for his Obey campaign, Barack Obama “Hope” poster and most recent “We the People” work, will bring his favorite signature imagery to the Plaza Hotel, which is the tallest building he has painted in Las Vegas. Recognized for his pop-art style, D*Face will create a unique mural using bright colors, graphic shapes and comic book images. For more information, contact Amy E.S. Maier, Faiss Foley Warren PR, amy@ffwpr.com. Tickets for the 11th Annual Vegas Uncork’d by Bon Appétit celebration went on sale Jan. 31. The event is recognized as one of the country’s top food and spirits festivals with one-of-a-kind experiences and a world-class lineup of renowned celebrity chefs, master sommeliers and cutting-edge mixologists from Caesars Palace, The Cromwell, The Cosmopolitan of Las Vegas, MGM Resorts International and The Venetian Las Vegas. Vegas Uncork’d will take place April 27-30. For more information, contact Kate Whiteley, Kirvin Doak Communications, kwhiteley@kirvindoak.com. One of the most anticipated annual food and wine events, UNLVino, returns for three dates of festivities, March 30 through April 1. Events will include: Bubble-Licious at The Venetian featuring champagne, sparkling wines and award-winning restaurants from The Venetian and The Palazzo’s outstanding collection; Sake Fever at Red Rock Casino Resort & Spa highlighting a variety of sakes, Japanese spirits and cocktails complimented by cuisine from some of the destination’s top restaurants; and the Grand Tasting at Paris Las Vegas carrying on the tradition as UNLVino’s signature event. For more information, contact Kelli Maruca, Fine The Agency, unlvino@finetheagency.com.